Adventure - Experience a grand adventure and many fascinating quests, as you strive to unite the forces of good, and fight the dark powers threatening to enslave the whole of Driftmoon. Enchanting world - The world of Driftmoon is filled with personality, wit and goodwill! 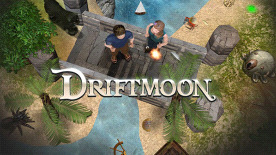 Explore the dungeons, wilderness and villages of Driftmoon: You'll discover hidden places, treasures, quirky characters, quests, puzzles, unique magical items, secret doors, artifacts, and more. Friends & Foes - Fight the forces of evil and meet charismatic and personal creatures, some of which may accompany you on your quest. The inhabitants of Driftmoon have distinct personalities, histories, humour, and abilities. Character Development - Learn many impressive and powerful skills: Your choices will affect your possibilities, when facing foes or travelling the world. Rich Soundscape - Carefully constructed sound effects, and atmospheric background ambience. Including a memorable and melodic soundtrack by the talented Gareth Meek. Powerful editor and one-click mod installation - Driftmoon comes with the full editor tools used to create the game, and the possibility to play mods created by other users. The editor includes an easy scripting language, animation tools, and a great level editor with numerous possibilities! Adjustable Text Size - Can't read tiny text? No problem! You can freely change the text size in Driftmoon. Fully grown, well behaved adventure-RPG with a charming personality! Comes with Fizz, the hyperactive firefly lamp! Light Boots: Leave glowing footprints! Evil undead mages, magic staves and more!